Forestry or timberland as an asset class is quite diverse in its own right. Trees and plants have many characteristics that lend themselves to an extremely wide range of uses, evidenced in the way communities throughout the world use wood and its by-products. The recent commitment to reducing greenhouse emissions globally has seen initiatives emerge to encourage the growth of trees, reduce deforestation and develop renewable energy sources. Institutional investors and high net worth individuals have invested in forestry for some years as the potential returns are attractive. Taylor Scott International’s expertise lies in bringing this once limited opportunity to a broader number of investors through it forestry investments division, TSI sources the correct species of tree or plant, ensure that they are nurtured and harvested in the most advantageous environments, and then bring the products to markets that will generate maximum returns for our clients. TSI is offering clients the opportunity to invest in agarwood, also known as “the wood of Gods”. Even by rainforest standards, the aquilaria tree is remarkable. Aquilaria produces rich and resinous heartwood, called ‘agarwood’, and it has been traded globally for centuries. This rich, resinous wood is used in incense production, it has medicinal purposes and its pure distilled resin is widely used in the perfume industry. The dark resinous agarwood forms in the aquilaria tree when it becomes infected with a type of bacteria that occurs naturally in the wild. As the infection takes hold, the tree produces the dark aromatic resin as a natural defence to the bacteria infected areas. The resulting heartwood is highly sought in many parts of the world and when extracted from the tree, is either processed into wood chips for aromatic burning or distilled in order to produce ‘Oudh oil’. Both have a distinctive fragrance and are highly valued. 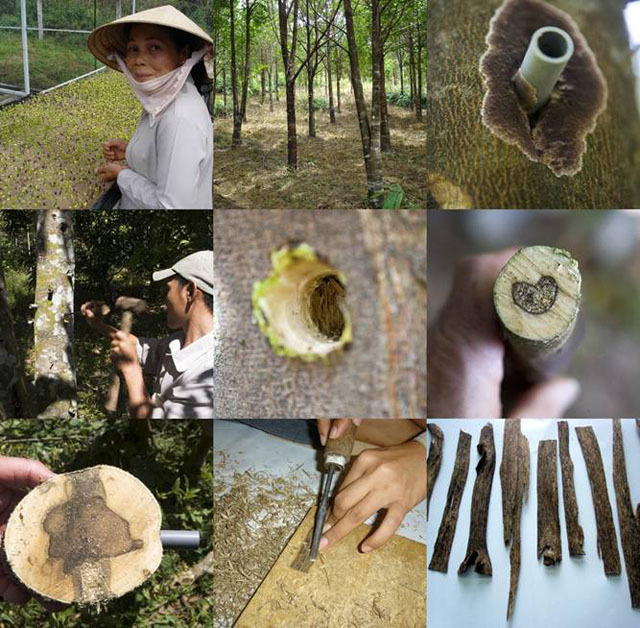 However, not every aquilaria tree will become naturally infected with the disease and produce agarwood. But after 10 years of research, headed by a professor at one of Thailand’s most respected universities, a team of bio-technical scientists developed a commercially viable method of forming resin in plantation aquilaria trees. The inoculation kit has gone on to provide higher yields and higher quality wood when compared to kits already in circulation today. This new method is protected by three patents and has been used to create Oudh oil that has been independently certified as grade A+. Growth in the population and affluence of consumer markets in Japan, Taiwan, Saudi Arabia, and the United Arab Emirates (UAE) has seen demand for agarwood soar over the past 30 years. This demand has resulted in rapidly diminishing stocks in the wild, pushing up prices and leading to concerns over future supplies. As an organisation, we were quick to identify the benefits of working with this innovation in agarwood production and have tailored an exciting investment solution for clients. This particular investment is typically classed as a medium-term investment where clients have the opportunity to receive returns at approximately 7 years from the date of purchase. However we are continually acquiring new plantations that have standing existing trees and, subject to availability, we are able to offer short-term investments that can produce returns from as early as the second year, after the date of purchase. Whilst taking the time out to evaluate this proposal please note the following points below. If you require further detailed information, including costs and a forecast, please feel free to register your contact details on our ‘Contact us’ page. Demand: There are around 80 countries that import agarwood annually but the biggest importers of the commodity are the UAE, Japan, Saudi Arabia and Taiwan. The largest exporters are Singapore, Malaysia, Indonesia and Thailand. The value of agarwood exported from Singapore alone has been estimated to exceed $1.2 billion per annum (United Nations FAO). Supply: By the early 1990s, the aquilaria tree had been harvested to near extinction in Southeast Asia and was classified as an endangered species leading it to be placed on the Convention for International Trade in Endangered Species (CITIES) list. The listing makes it illegal to harvest or trade the commodity without a CITIES permit. Private sector investment in commercial and sustainable plantations has led the drive to protect the trees in the natural forest by providing a viable substitute. Yet at present, only 35% of global demand is being met by the agarwood producing countries (Forest Research Institute of Malaysia). Investment Solution: : TSI offers investors the unique opportunity to take advantage of high returns made from the aquilaria tree. We provide plantation grown trees, inoculated with a scientifically award-winning kit, that are then harvested in our own distillery (subject to jurisdiction) with an end user market already engaged. That is why we are confident that this represents an exceptional investment opportunity. Before any purchase is made you are required to register your interest either by phone or email, details can be found in the Contact Us section of the website. The investment will be explained in full and will include price points, marketing material, forecasts and analysis. Our investment consultants are fully-trained and pride themselves on their knowledge and experience within the sector. Each has visited our plantations in order to appreciate the operations in practice. Once you are comfortable with the product, the company and the consultant, and are happy to proceed with the investment, you will be required to fill in an application form and the purchase cycle will begin.